Re-releases are strikingly common in this day and age, but two re-releases? Such a phenomenon is only the product of a Japanese game. It’s far from a negative however, as Team Ninja has once again revamped and supplemented Dead or Alive 5 with a number of additions that give the game a bit more meat. While it’s not really worth the expense to double-dip with the fighter if you’ve already purchased the full game, Dead or Alive 5: Ultimate does justice to its subtitle and is a good buy for fighting game fans. Ultimate adds a fairly impressive amount of content to last year’s fighting game. Perhaps most noticeably, another 5 characters get added to the roster. Classic franchise fans may delighted to find that Ein and Leon make their return after a hiatus. The Ninja Gaiden series offers up Momji and Rachel, and Virtua Fighter’s fans get fair shake as well with Jacky Bryant (with his moveset intact). Some of the newcomers are only slightly different from existing fighters, but offer a couple of fun twists that make them highly interesting to play against and show promise for how Team Ninja will go about character design in the future. Rachel is a surprisingly heavy-hitting brawler, while Momji has an aerial game that breaks relatively new ground for the series. They’ll get to fight through an expanded variety of stages, all of which are solid additions to the existing batch (a multilevel desert stage is the standout). The face-value level of content here is impressive, and makes Ultimate the clearly superior version of the game. It’s not just characters and stages that have been added, however. A much-welcome tutorial mode (expanded from the Vita’s Dead or Alive 5+) will be an excellent tool for newcomers or those looking to get better at DoA. A massive list of lessons involving the tiniest facets of the game’s system will keep any apprentice busy for a long while. It’s useful even for consulting every now and then, such as if you see an opponent execute a strange move or come across a battle notification you’ve never seen before. It’s all in there, and even veterans are likely to find something useful. Said veterans will get to add another move to their repertoire as well with the addition of Power Launchers. These are similar to the Power Blows in that they can be activated once the user is below 50% health. The innovation is that they launch the opponent into the air to set him or her up for a juggle. This is a potential game-changer if used correctly. In terms of modes, Team Ninja has first and foremost added a very exciting cooperative tag-team online mode. You and an online friend can team up against another pair online. The 2v2 setup has always been an exciting mode in fighting games, and in Ultimate it is no different. Far from just switching out players when it feels right, correct and timely switching can help chain combos together; the first player can start a combo, then smoothly tag out to the second player so the combo can be seamlessly continued. These are among the most satisfying things you can do in the game, and getting that huge combo set up is very exciting. There’s also a very cool Survival mode. This is a seamless mode that does exactly what the name suggests: you take on waves of opponents one at a time, and grab health and point bonuses in between combatants. There are no loading times, and no breaks in between matches. It’s a blistering, thrilling mode and highly addictive to see how far you can go each time. It wouldn’t be a Dead or Alive game without new cosmetic options for the fighters, and many of them get new costumes as well as additional hairstyles and entrance animations. The first few costume DLC packs are also included, but for some reason the second half of the collection (the most recent packs) still have to be purchased. If you’re really a fan, you can set up cinematic fights and take pictures of the combatants. Of course, these don’t change the core content of Dead or Alive 5. For the uninitiated, the franchise’s fighting system is heavily based on long combos and counters. Skilled players can chain together large combos, but an equally skilled player can easily counter these. The two major variables are the longer-than-normal stun time after getting hit, and the fact that successful counter-holds have to correspond to the attack that is being delivered. In other words, a High attack will have to be stopped with a High counter. This is the real meat of the fighting system: learning your opponent’s tell and being able to plan a millisecond ahead with the right counter is the way to victory. Countering incorrectly will open you up for a devastating stun. The fighting system accommodates button-mashing, so there aren’t too many long button inputs to memorize. It’s accessible to many skill levels, which is both a strength and weakness. Some characters are able to spam the same move over and over, and will have the match in the bag if they can back the opponent into a corner. This holds the game back from being the sort of compelling tournament-ready title that it could be. While a good counter game can help keep the button-mashers in check, the scale tips ever-so-slightly to the move-spammers and can make the game seem unfair. You’d be hard-pressed to find a modern fighting game that doesn’t incorporate a number of secondary meters and weighty variables. The Dead or Alive series continues to champion a mentality of relative simplicity, incorporating no more than a single health bar and the aforementioned Power Blows. Other than that, this is purely about fighting hard enough to defeat your opponents, with no chance of the tide getting suddenly turned by a ridiculous super-move handicap. The major addition that came with the fifth installment of the franchise was that of “action scene” stages, fighting arenas that have certain areas that launch massive explosions or destruction when triggered. It’s quite the sight to see someone get punched hard enough to derail a train and send it hurtling through a building. Some of these points are mildly unbalanced in the amount of damage they can cause, but they’re entertaining enough to be a solid addition. Unmistakably, the game looks fantastic—occasional questionable fire effects and ambient object modeling are lone outliers surrounded by otherwise great visuals. It’s the attention to detail that really impresses here; from sweat dripping off of a combatant’s brow, to dirt covering an outfit, to water leaping up during a high kick in a shallow pool, Dead or Alive 5: Ultimate is not short on impressive visuals. Those, however, are nothing compared to the character models: hallmarks of technical ingenuity on multiple levels, from physics modeling to motion capture. Yes, that physics modeling does include the breast physics, but isn’t that to be expected by now? There’s a hilarious option hidden in the menu that allows you to toggle breast physics between “Natural,” “DOA” and “OMG,” with predictably absurd results. Clothing ripples convincingly, and hair is startlingly realistic. The facial modeling of the characters is almost unrivaled, with eye movements being a standout. The story mode is still ridiculous and thin, but serviceable. Similar to Mortal Kombat, it’s a sprawling narrative that encompasses just about every fighter in the game, with various threads appearing and disappearing before intersecting with yet another plotline. It basically follows the inception of yet another Dead or Alive fighting tournament and the lives of those involved in it, with minor peripheral stories as well. Overall, it’s still absurd, and there are obviously strained attempts to start fights (or no reason given whatsoever). All the same, the time and effort put into rendering the cutscenes and putting together the story is impressive, and not unappreciated. As all good fighting games should, Ultimate has an online mode, though the matchmaking system is sluggish and ineffective. Expect to be staring at the “Searching for opponents” screen for a good while. However, once you’re in a game things go generally smoothly with minimal lag. An outrageous number of titles to assign to your profile, as well as a robust system for earning points and rankings, gives the online scene for Dead or Alive 5 plenty of staying power for the dedicated. If you don’t want to get absolutely thrashed by an online opponent, it’s highly recommended that you spend a good amount of time in the single-player modes before stepping into the online arena, as the game’s strong following lends it a large population of skilled players that have been honing their skills since they’ve been able to do so. There is, however, a convenient option in the matchmaking menu that allows you to set a minimum and maximum skill level for opponents, helping to ensure that whoever you are facing falls within a certain skills range and mostly eliminates the chance of getting paired with a master of the game if you’re not ready. 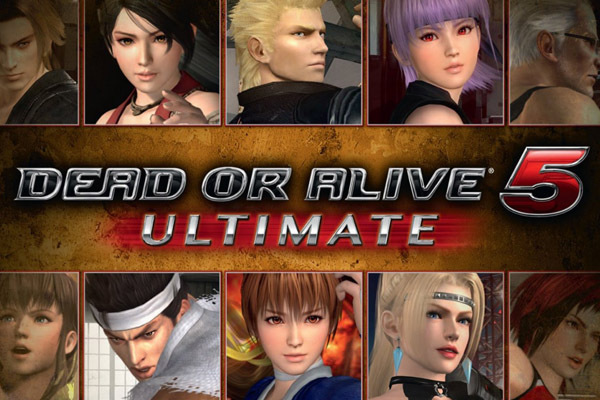 Certainly, Ultimate won’t change your mind about Dead or Alive 5 either way. At its core this is still the same game with a few extra frills. At times, it does feel like a content pack and patch rolled out in disc form (though still requiring you to pay for some of the later bonus costumes), but it is a lot of content, and a good addition to the game. If you haven’t had a chance to get in on the game yet, Ultimate is the definitive version of 2012’s best fighting game. Dead or Alive 5: Ultimate was developed by Team Ninja and published by Tecmo Koei. A PS3 copy of the game was provided by the publisher for review purposes.